Easter desserts can make the celebration of the Resurrection of Jesus extra special. Our family has had a tradition for years of getting together after church on Easter Sunday for a family dinner. The girls of the family all try to bring along something yummy to help out with the meal. That's why I do a search for Easter dessert recipes that my family will find interesting and very tasty. Martha Stewart's website is one of the places I look first. I know some people don't like Martha, but I love the clever crafts and recipes she comes up with on a regular basis. She is really quite good! My attempts at Easter desserts don't always turn out as nice as hers, but I get inspiration from her all the same. These Easter dessert recipes are a credit to Martha, and this is one of my favorites. If you give it a try, I'd really love to hear what you think and see some photos of your dessert creations. Preheat oven to 350°F. Prepare two 7 inch round cake pans by spraying them with cooking spray and lining them with parchment paper also coated with cooking spray and then sprinkled with cocoa powder on top. Tap out any excess coca powder. Set aside pans. In a large saucepan, melt the butter over medium heat. Whisk in the cocoa, espresso, and water until dissolved. Then add the sugar and continue whisking until smooth. Remove from heat. Stir in the remaining cake ingredients - eggs, buttermilk, vanilla, flour, baking soda, and salt; whisk until well combined. Pour the cake batter into the two prepared pans and bake for about 45 minutes or until the skewer (cake tester) comes out clean. Allow the cakes to cool for 20 minutes before removing from the pans. Remove from pans and peel off the parchment paper then allow to completely cool. Trim the tops of the cakes so that they are level for stacking. Place the first layer (cut side up) and frost with 1/2 cup Ganache. To make the Ganache frosting, place 8 ounces of chopped chocolate and 1/2 cup of heavy cream into a heatproof bowl set over a pan of simmering water (double boiler). Stir together until smooth and then refrigerate it. Stir occasionally over the next 10-15 minutes until it stiffens up a bit (like cream cheese) and then whisk it until it's nice and fluffy and smooth. Then place the other layer on top (cut side down), and finish frosting it with the remaining Ganache. Refrigerate about 15 minutes until firm. Melt semisweet chocolate over a double boiler along with the cream and corn syrup and stir until smooth. Allow to cool for about 5 minutes and then pour it over the cake and refrigerate about 15 minutes until nice and firm. Make the "nest" by scraping the milk chocolate bar with a sharp knife at a 90° angle to form a nice pile of curls and shards (about 1 1/2 cups). Refrigerate to keep firm until ready to serve. 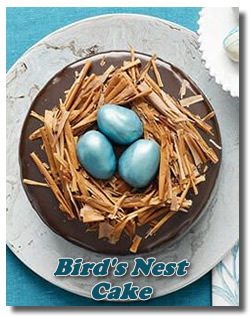 Place cake on a nice cake plate and use the chocolate shavings to form the nest. Then fill the nest with chocolate eggs. You can make your own or used store-bought eggs. I know it sounds a bit "involved" but it's really not that hard if you take it step by step. I hope you'll enjoy the first of these Easter desserts recipes. By the way, if you want to make your own chocolate truffle eggs like in the photo, you'll find the recipe at Martha Stewart's website. Do you have an Easter dessert recipe idea that you picked up somewhere along the way? Share it with the rest of us! If you've got a photo, please do show off a bit. We'd love to see your work.